Kellogg International Scholar and International Development Studies minor Rosemary Agwuncha ’18 is known to many international students on campus as a mentor, friend, and scholar. As an incoming freshman, Agwuncha came to campus six weeks early through the summer Balfour-Hesburgh Scholars Program; it was then that several upperclassmen encouraged her to seek out opportunities at the Kellogg Institute, including the International Scholars Program. These upperclassmen acted as mentors, giving her advice on programs to pursue, funding sources, and enrichment opportunities beyond the classroom. Agwuncha has since embraced the role of mentor enthusiastically, offering advice and sharing her experiences with other Notre Dame students – and particularly, with international students or those who, like her, have strong family ties to another country. Both of Agwuncha’s parents were born and raised in Nigeria, and she was born in the United States. Agwuncha traveled to Nigeria with her family frequently throughout childhood, often for a few months at a time. Her family’s African roots influenced her to reach out to other students with international backgrounds. 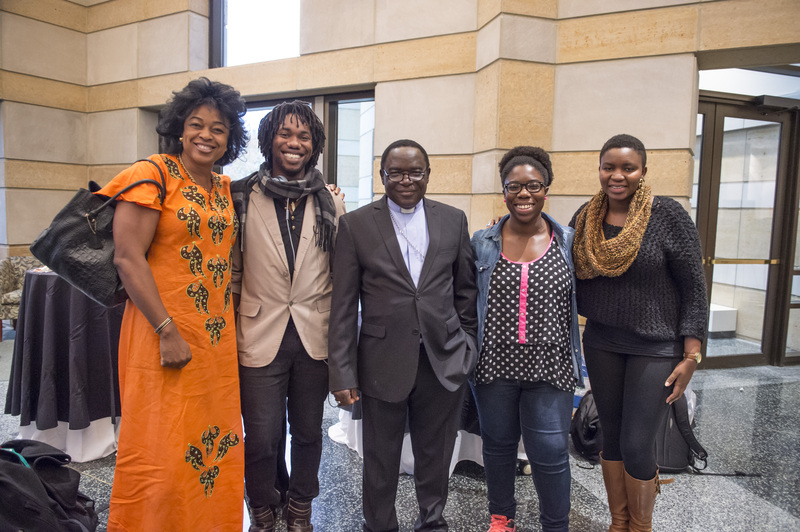 In doing so, the pre-health studies/theology double major has become an important link between the Kellogg Institute and other students with ties to Africa. “I honestly don’t even remember when I met Rose because it feels like I’ve known her forever,” Kellogg International Scholar Akua Agyei-Boateng said. Agyei-Boateng met Agwuncha through Voices of Faith, a gospel choir on campus. Agwuncha often tells students that getting involved with Kellogg can put them on the path to achieving their aspirations. International Development Studies minor Eunice Agyapong bonded with Agwuncha over their identities as first-generation Americans with African parents. The Kellogg Institute has not only been a place of community for Agwuncha, but also a source of intellectual engagement. Given her own attention to meaningful relationships, it is no surprise that Agwuncha’s research is centered on human interaction and compassion. Through an Experiencing the World Fellowship, Agwuncha spent a summer in Nigeria studying medical travel and its implications for the healthcare system. Much of her time was also spent re-establishing relationships with extended family and reviving memories of the places and people from her past. While there, Agwuncha noticed a power imbalance in physician-patient interactions. “I felt there was a lack of compassion for the patient that I wanted to explore and find solutions to work towards improvement,” she explained. Agwuncha refocused her research on the role of compassion and human dignity in healthcare. Returning to Nigeria on a Kellogg/Kroc Undergraduate Research Grant, Agwuncha assessed the level of compassion that patients believe they receive and the amount of compassion that doctors believe they convey during care. She wanted to understand how compassion affects patient satisfaction with care, as well as what factors might prove to be a barrier to compassion in Nigerian healthcare. Her research found that a lack of staffing and resources often causes doctors to sacrifice time and compassion with their patients. “I wanted to seek a holistic approach that will work for the benefit and the improvement of both ends of care,” she said. Agwuncha hopes to continue building relationships through a career in global health as a medical doctor and spend time in Nigeria and the United States collaborating with global health professionals.